Smith & Nephew OPSITE Post-Op Bacteria-Proof Dressing, 4" x 4.75" - 20ct was designed to allow constant monitoring of the wound without the need to disrupt the healing process through unnecessary dressing changes. The OPSITE Post-Op Dressing was designed to allow constant monitoring of the wound without the need to disrupt the healing process through unnecessary dressing changes. This dressing provides a barrier against backteria including MERSA and manages exudate through a highly absorbent pad and breathable film. This dressing is easly to apply and reduces pain upon removal. Effective Incision Site Management: Helps provide an optimal balance between excess wound exudate and the amount of fluid required for moist wound healing. 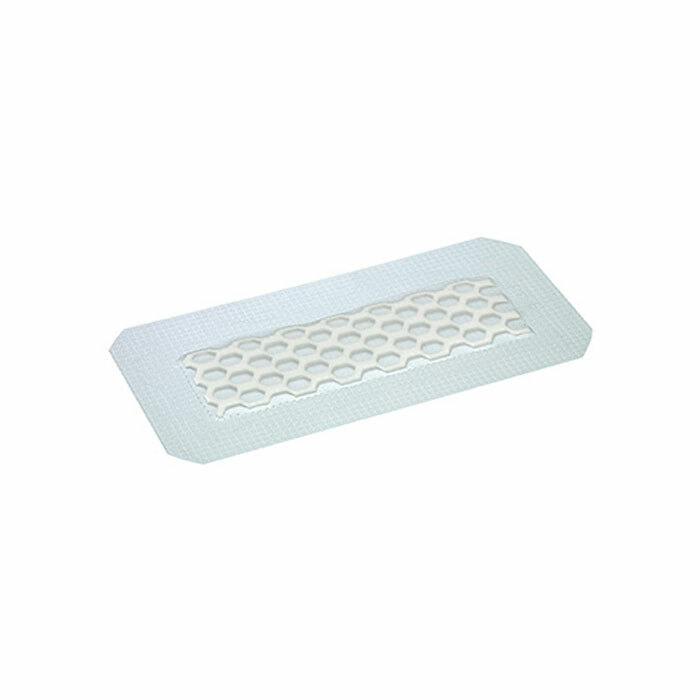 Continual Monitoring: This unique honeycomb design allows for continual monitoring of the incision site without the need to disrupt the healing process. Provides a barrier against bacteria, including MERSA. Allows constant monitoring on the wound and peri-wound area. Manages exudate through a highly absorbent pad and breathable film. Easy to apply and remove aseptically. Reduces the risk of blistering. Contains 20 Post-Op Bacteria-Proof Dressing, 4" x 6". Step 1: Remove the dressing from the outer packaging and peel away the white/orange backing papers marked "1". Step 2: Holding the non-adhesive tabs at the end of the dressing, carefully position the dressing over the designated area. Step 3: Smoothe the dressing into place, applying light pressure around the edges. Step 4: Using the small tab, begin to gently peel of the top carrier marked "2". Smooth the dressing down and ensure your patient is comfortable with the dressing. Step 1: Lift one corner. Step 2: Pull towards you - away from the pad. Step 4: Repeat along the edges of the dressing.